Dance, friendly competition and fond memories were the story of the day across the country on Day 2 of the 2019 All Seniors Care Seniors Games with hundreds of athletes competing in various events at retirement communities across Canada. Wii Bowling and Archery competitors pushed themselves to achieve personal bests. National medals will be awarded at a special awards presentation during Closing Ceremonies at the residences on Friday, Feb. 8th, 2019. Media are welcome to attend all events. ‘Hats off’ thank you to our Mission Staff at each residence, without whose hard work the Games would not have been possible. 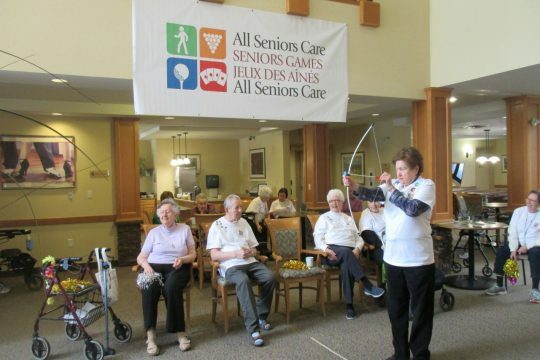 The Seniors Games are part of the All Seniors Care commitment to providing seniors with innovative ways to enjoy an active and healthy lifestyle. Bocce, Billiards & Pétanque – Round robin play in the morning with Finals in the afternoon followed by Medals Ceremonies and entertainment.